On the left is the Simon Davis house, which was later owned by H.M. Field, Anson Field and R.B. Field. Simon Davis established a sawmill and a factory for making wooden water pumps and tubing at an early date, and this was later expanded by he and his son-in-law, Henry Field about 1856, and upplied a wide territory in New England until about 1900, when iron pumps took their place. In 1932, the house was purchased by Horatio and Adelaide Curtis, who established a mink ranch with two females and one male. By 1937, they had over 500 mink, and had 1000 mink when they ended their business in 1947. In the distance can be seen, from the left, the so-called Day House, built by Henry Field in the mid-1870’s, later owned for about 50 years by the Buel Day family, and later sold to Matthew DeGroot. 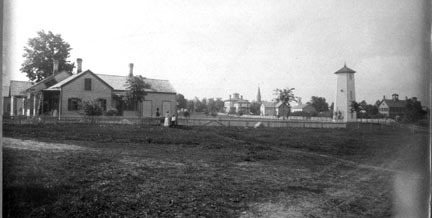 Just to the right of that is the spire of the Congregational Church; further to the right is the Methodist Church, the water tower, and the Jericho Elementary School, now the Jericho town offices.